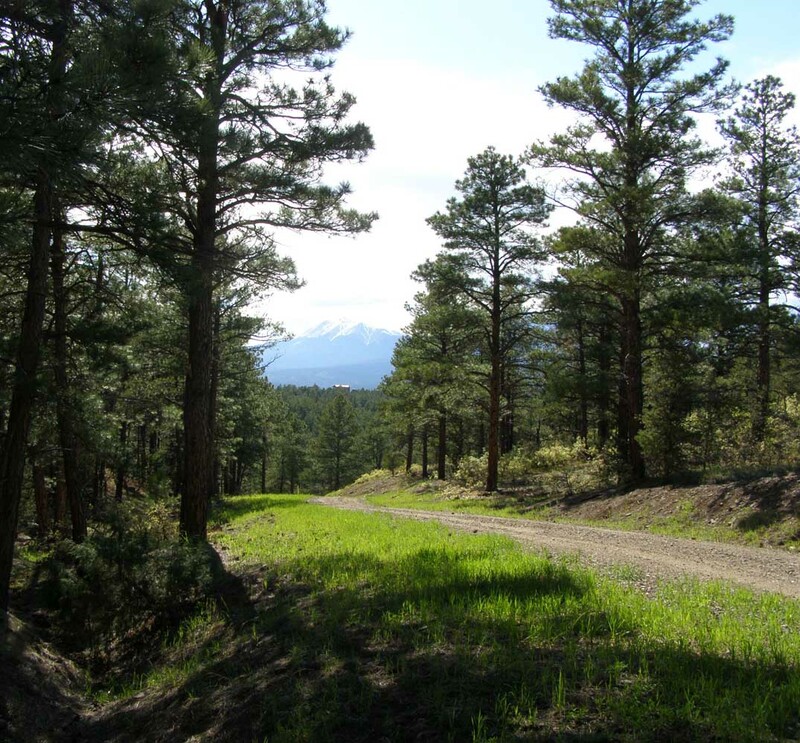 views, plentiful wildlife, well over a half a square mile of your own national forest quality ranch land. west of the Spanish Peaks. 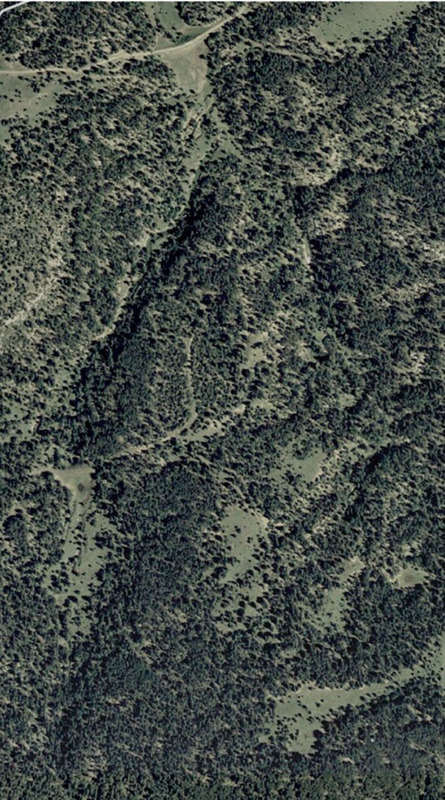 Elevation of this ranch is roughly 7,100', with year around access. One of the largest herds of elk in the entire state of Colorado is located within this county. Great Prepper or Retirement Property (low taxes)! This is my favorite building site, just within the trees, on the east side of this meadow, with great views of the Spanish Peaks. 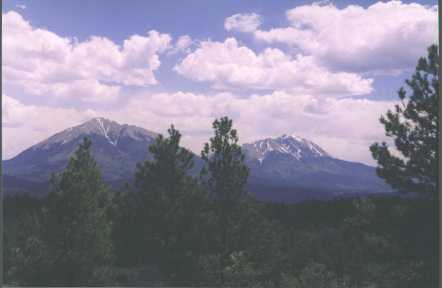 The Sangre de Cristos are just west of the Spanish Peaks. Late fall picture. 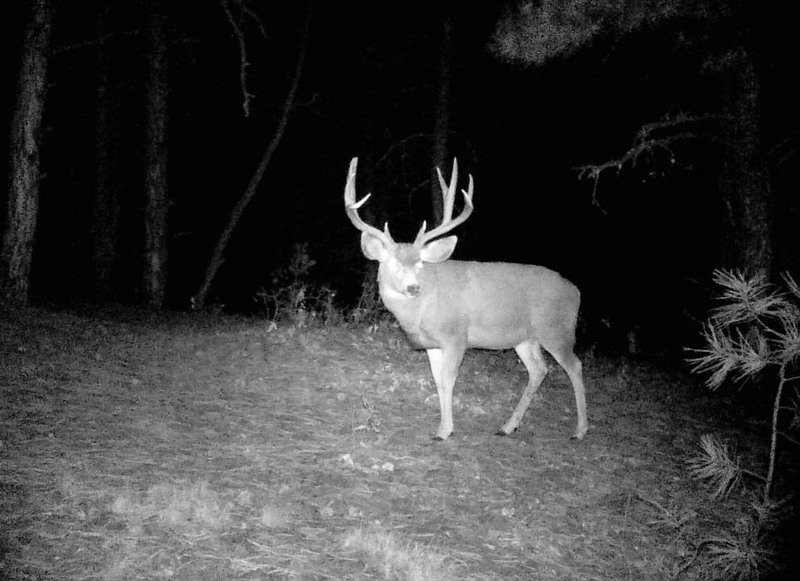 Taken on 100ac tract. 3) 265 acres for $855,000 All, minus 2 northern tracts (28,29). Includes the 100 acres. (35-38+acres each), includes tracts 25-29. 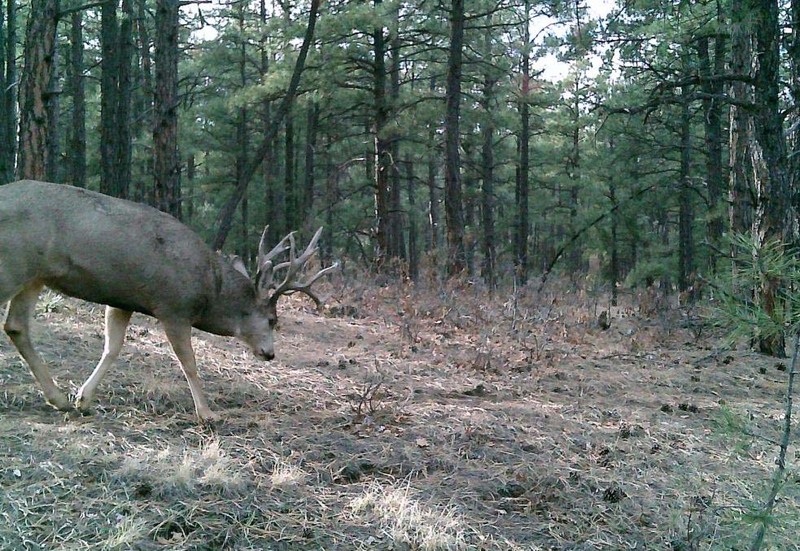 320 acres should get you two private-land buck tags per year, eventually. All parcels have both electricity and all weather roads to them, except tract 27 (not forsale alone). Currently all this land is available. 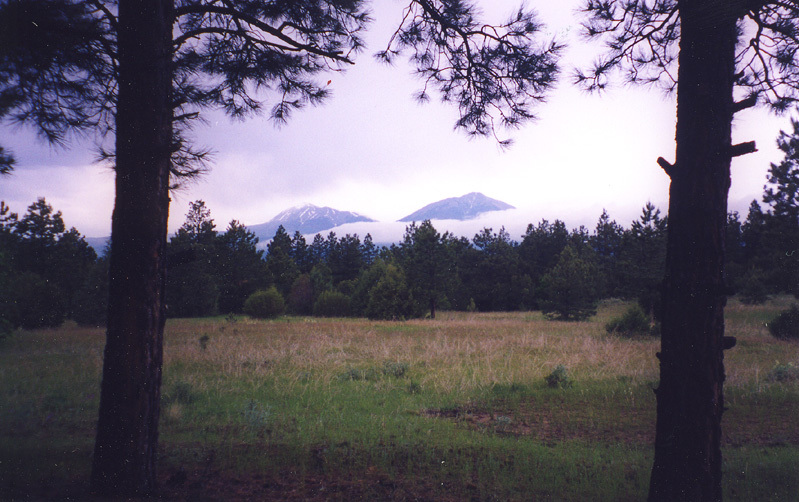 Spanish Peaks from the high meadow near my cabin. More details below, toward the bottom of this page, including maps, topos and pictures. 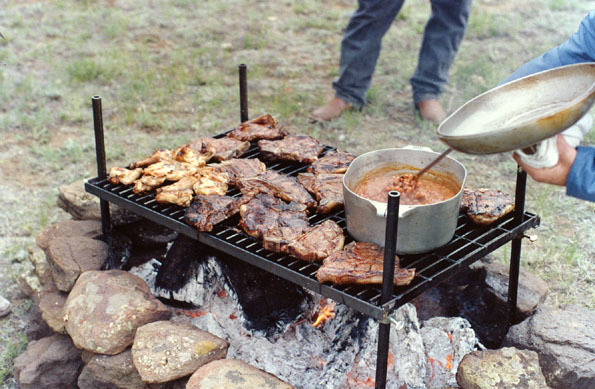 This ranch is located in southern Colorado just north of the New Mexican border and east of the Sangre de Cristo mountains (a southern extension of the Rocky Mountains). The two mountain peaks you see in the picture above are the Spanish Peak, which are two extinct volcanoes. 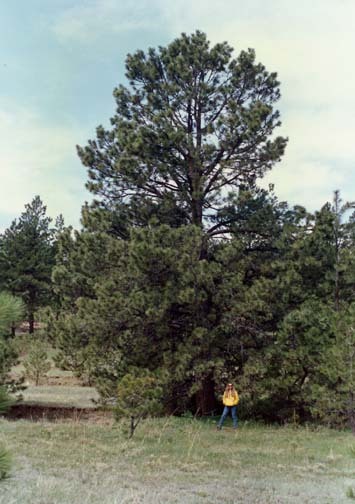 This land is roughly 70% covered with Ponderosa pine. The rest is a mixture of meadows, lush canyon bottoms usually with water moving through (see picture below), large rock formations and some Chinook. 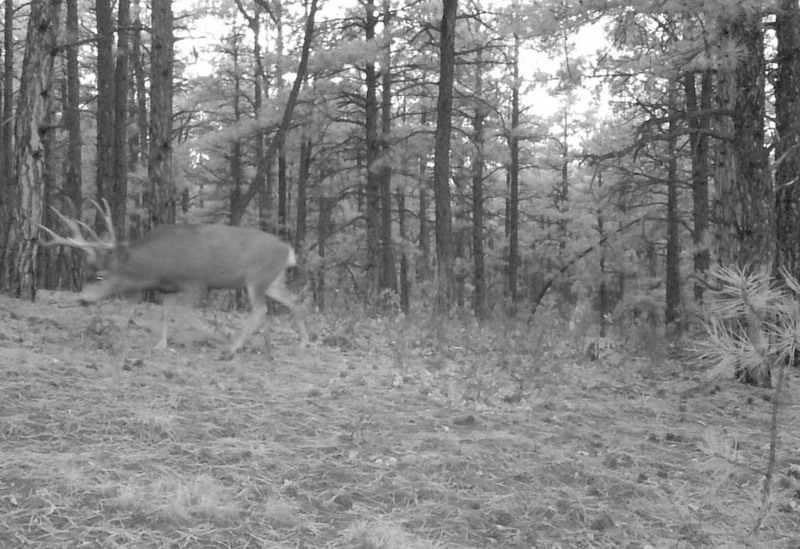 The wildlife is plentiful in this area of Colorado with Elk, black bear, mule deer, large Russian turkey, tufted eared squirrels, bobcats, lynx, coyotes and much more rarely, cougar may be heard, along with their sign being found. To be more specific, there are no other areas in Colorado that have a higher State rating in regard to the density of wildlife. 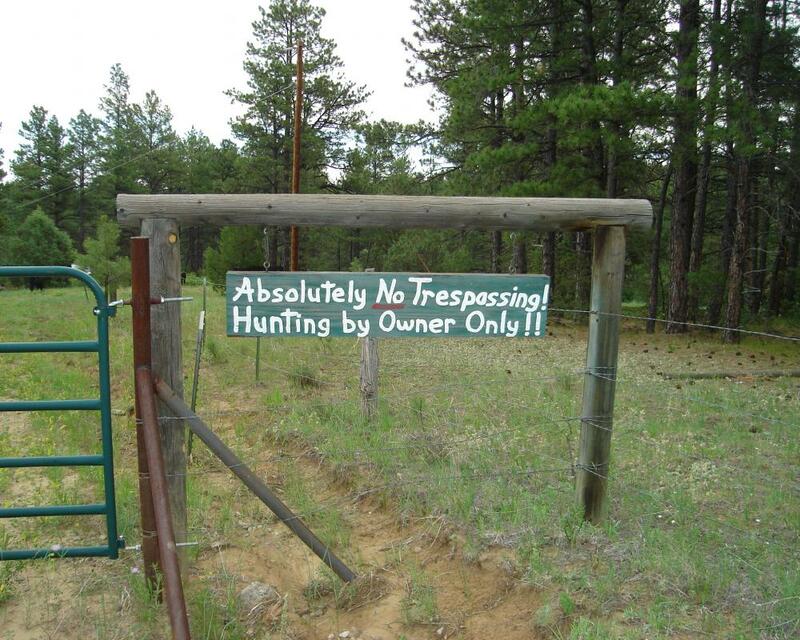 It's a good hunting ranch. There are lots of elk roaming around on this ranch, and you will see their tracks everywhere. 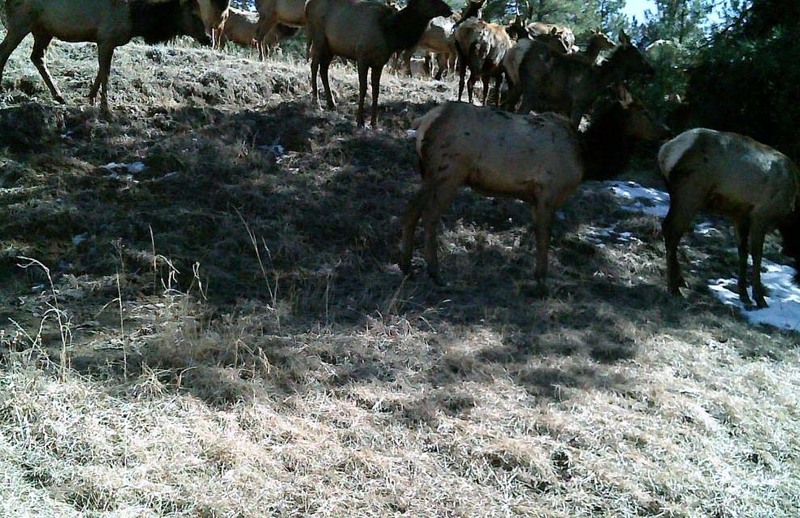 I've walked upon to groups of elk all over this property at various times of the year. If there is water and vegetation, they have no reason to leave and move into the high country. I've run elk and bear off the same area on the same day. 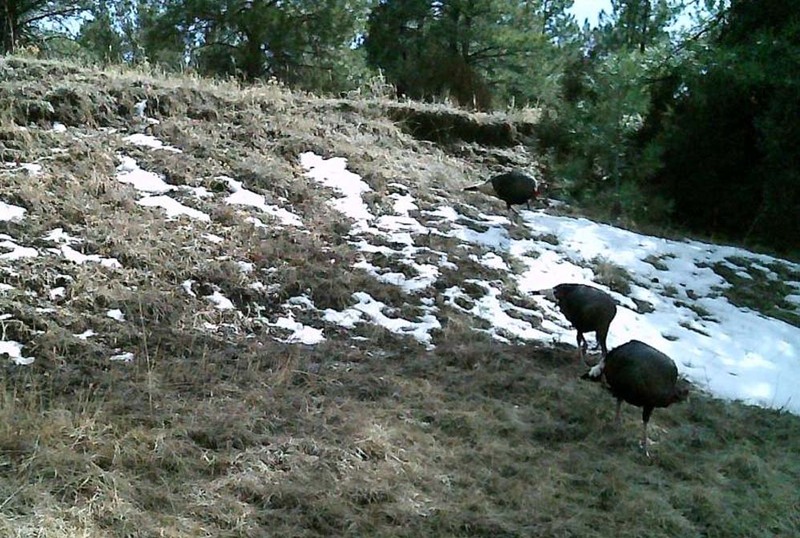 The turkey seem to like the area of the valley bottoms around western boarder. If you plant oats, which I did one year, they will never be far away. This land has a number of alternative energies available. There is several life times worth of standing trees that need to be thinned just to enhance the distance between healthy trees. Secondly, you have passive solar. Thirdly, you have wind power for running a wind mill to pump water out of your well into a cistern. Augment this with a propane tank and you will have little use of the electric company. Wood could be used for cooking year around (outside during the warm months and inside during the cooler months). And wood could be used for all HEATing needs during the winter. Passive solar could be used for a lot of your electric needs. This could be very low cost foot print to operate, including property taxes, which are very low, due to the AG exemption. Cuchara and the "Highway of Legends" are just over Cordova Pass at 11,000 feet. Excellent trout fishing and alpine hiking can be found between the pass and the Sangre de Cristos, northern New Mexico, or north or west of the San Luis valley. 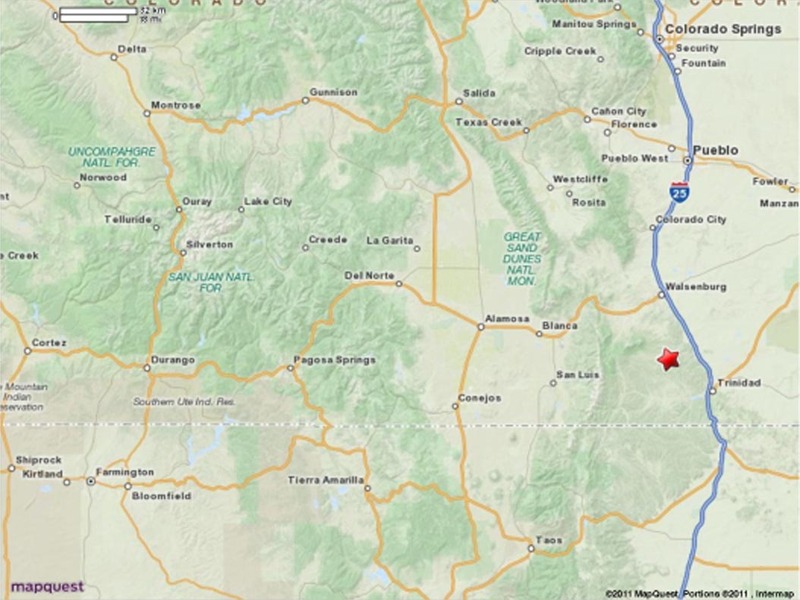 There are many centers of activity within a few hours of this area in just about every direction, including within northern New Mexico: Colorado Springs, Cuchara, Le Veta, Blue Lake, Bear Lake, Denver, Raton, Red River, AngelFire, Taos, Sante Fe, Pagosa Springs, Durango, Royal Gorge,..., and dozens more. This area is very rich in history and interesting places to visit. 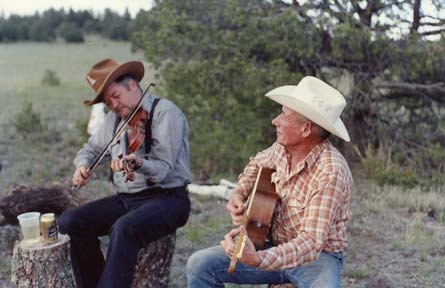 The weather on this ranch is moderate, with milder winters than further north or at higher altitudes and with beautiful summer days with cool evenings. The elevation on this ranch is between 7,200 and 6,900 feet above sea level. The distance between those two extremes is almost a mile. That's quite mild by Colorado standards. 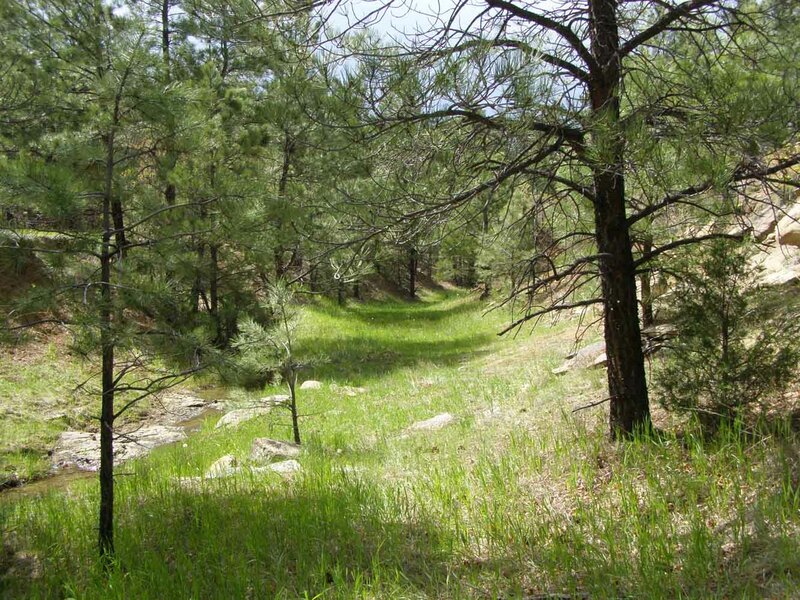 Much of the land is almost level and is quite easy to walk, ride your horse or hike around on. This 338 acres has a ranch road just on the northwestern corner of the property and then pulls away as it heads northeasterly. A second ranch road comes to the western boundary and enters the property. This road is just there to access this land, i.e. it's not a through road. A county road (CR 44.0) just touches the southeast corner. However, there are no roads along the length of any boundaries, so the native wildlife are not disturbed by the occasional passing vehicle along the northwest or southeast corners. This ranch is very private. 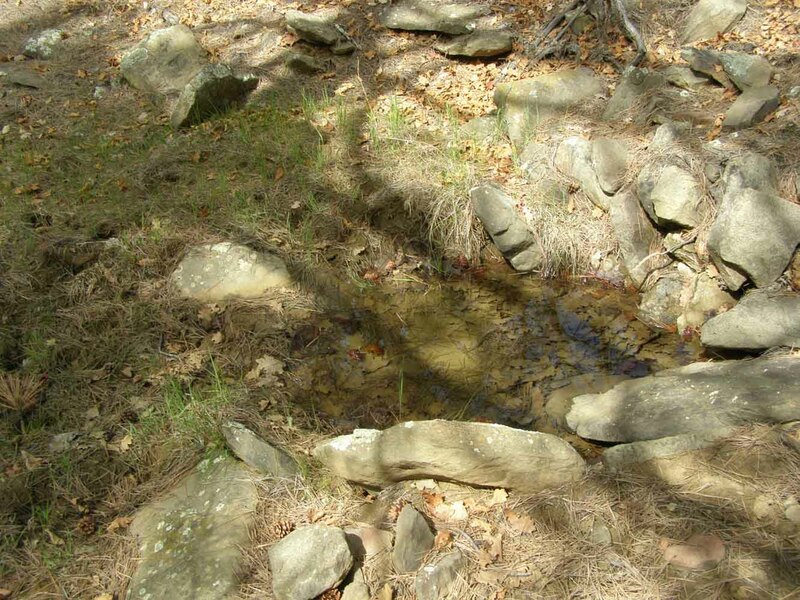 The buyer is responsible for their own well and septic systems. Other known wells in the area have been around 300-360 feet. This is the nicest area within the whole county, and there are some beautiful lands in this county, though most are within a National Forest or are in areas which are not kept open year around. The roads that provide access to all of this land is currently rocked. In addition, the ranch roads are graded during the winter months and kept clear of snow accumulation. 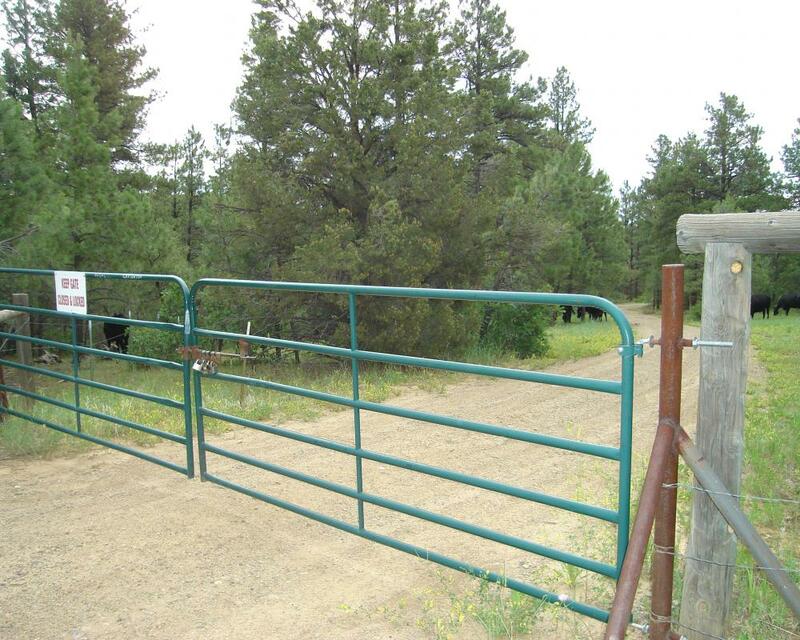 The entrance into these lands from the ranch is fenced & gated and the gates are kept closed. Even in times of heavy snows, the county roads have been kept open year around. 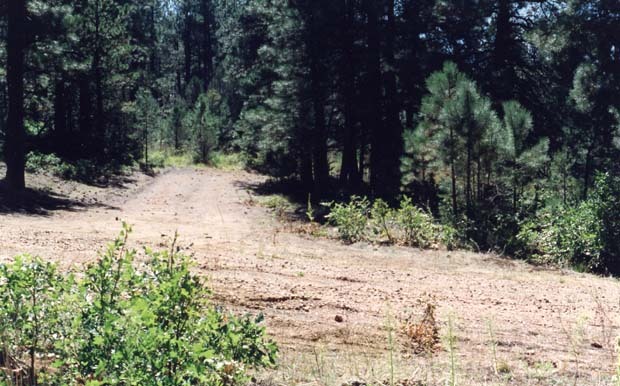 Amenities for these this land include: electricity and road access to the property boundaries and to the existing cabin. 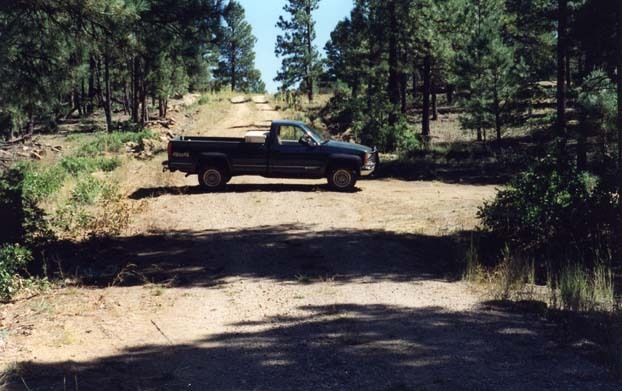 A private road also exists to several prime building spots at high points upon the ranch. Elevation is between 6900 feet & 7200 feet. 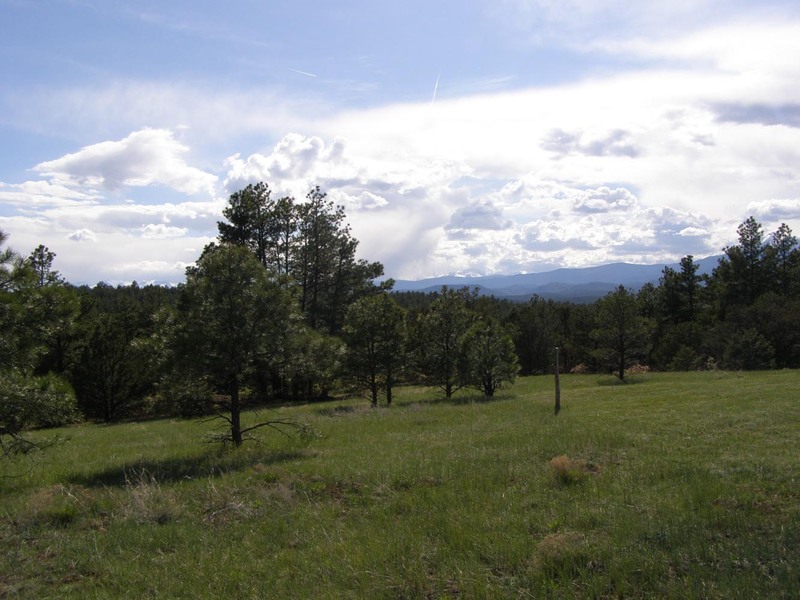 This property is located 4 miles from Gulnare, 13 miles from Groceries, Gas and basic services (schools), and roughly 23-30 miles from larger towns on IH-25: Walsenburg and Trinidad. 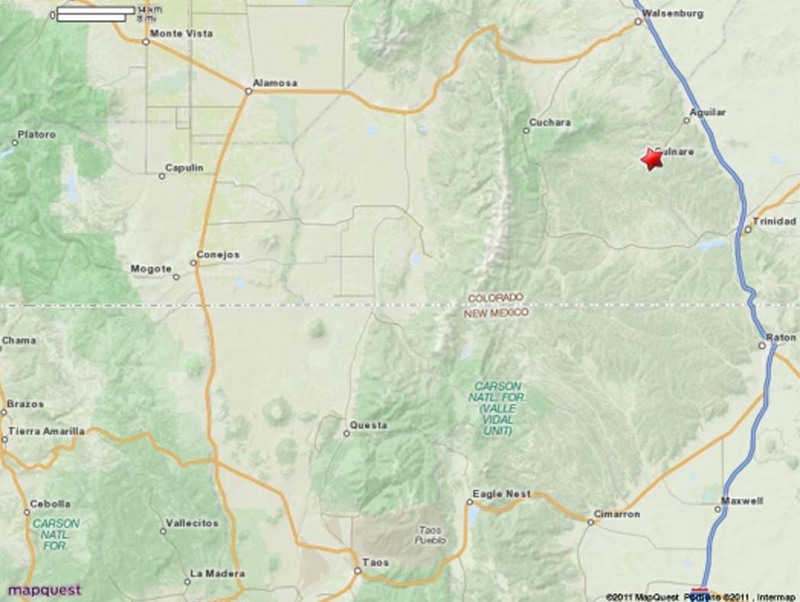 This ranch is geographically roughly 7 miles south by southwest of Aguilar (which is between Trinidad and Walsenburg on IS-25) and is about 7 miles (as the crow flies) west from IS-25. 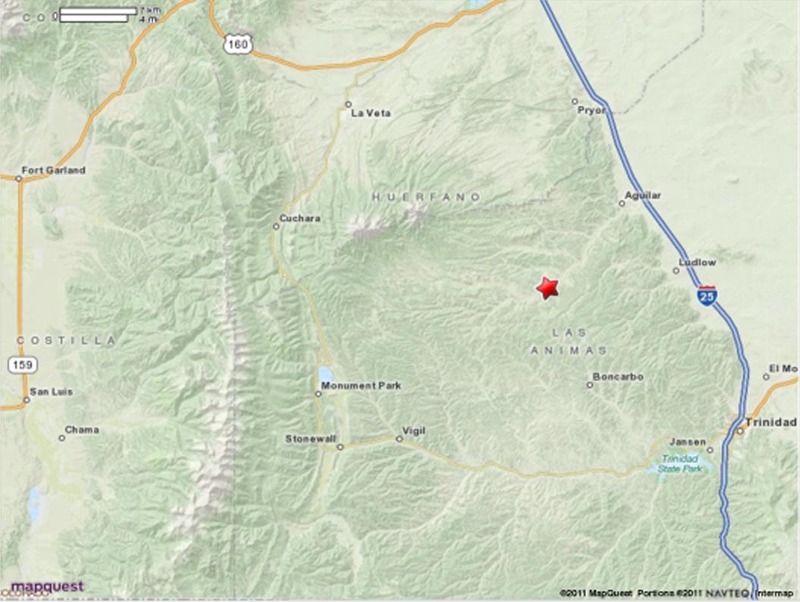 Las Animas county has a population of roughly 15 thousand with close to nine thousand in Trinidad, with the rest of the county being sparsely populated. Cuchara and the "Highway of Legends" are just over Cordova Pass at 11,000 feet. Excellent trout fishing and alpine hiking can be found between the pass and the Sangre de Cristos, northern New Mexico, or north or west of the San Luis valley. There are many centers of activity within a few hours of this area. Basic shopping is within 15 miles and more extensive shopping is in either Trinidad or Wallsenburg. 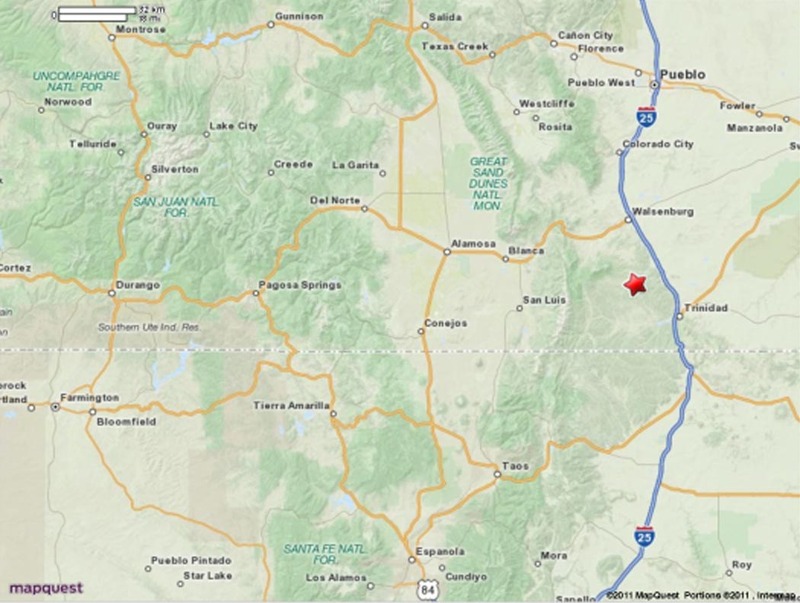 Pueblo is just over an hour away, with Colorado Springs about 2.5 hours away. This land is roughly 1 mile tall and a half mile wide. There is no road running along the length of the property. There are just the county road that just touches the southeastern corner and a ranch road that touches the northwestern corner. 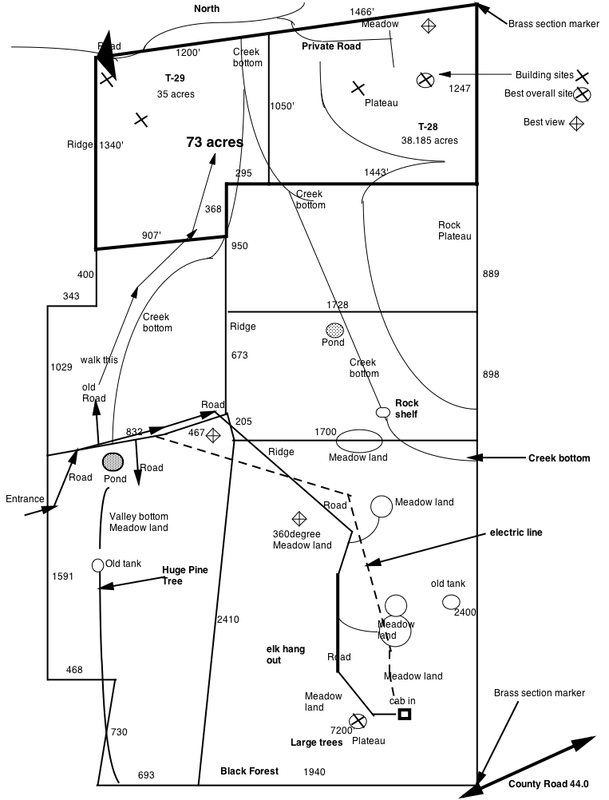 There is a private road (Bear Claw Pass) that comes into the west side of the property from the main North/South ranch road (Apishapa Lane) and deadends into the western boundary. This is the road that provides access to most of this property (264 acres of the 338 acres). There is a gate where this road enters the property on the western boundary. So there is minimal to no effect by road traffic to this property. Call for more information about this ranch investment. A total of 338 acres is availble for sale. See price above. One large estate of 338 acres is available, roughly one mile tall by a half mile wide. Regarding terms, an outright cash deal to the seller is required. Typical forest views under the tall trees. Pictures only give this land a flat 2 dimensional image. They're no substitute for actually experiencing the real forest, with the sounds of wildlife, the fragrance of pine and sage and listening to the breeze passing through the pines. You owe it to yourself to visit this beautiful and peaceful place if you're in the least bit interested in acquiring and developing your own environment away from the rat race of urban living. Ranch Land of this high quality is EXTREMELY rare. Don't miss out on this unique opportunity. 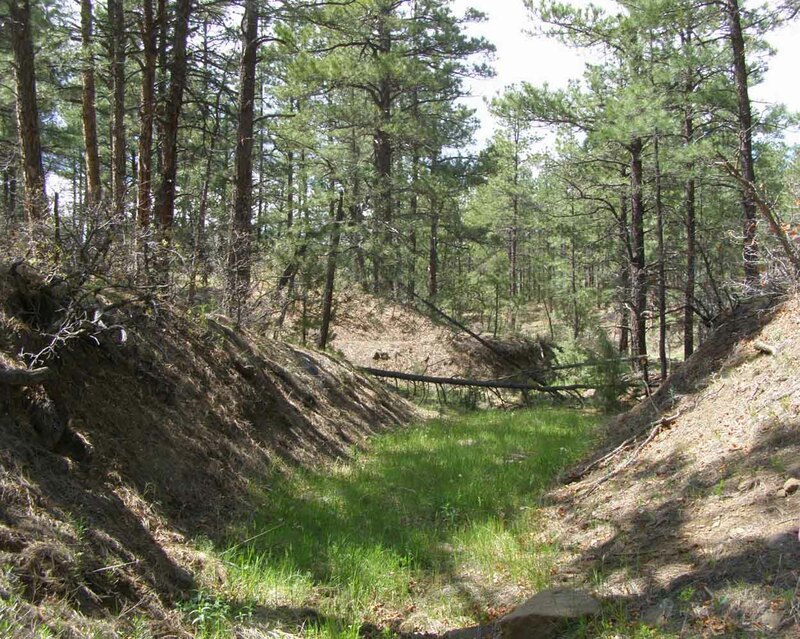 You will not find a ranch investment of this high quality within the state of Colorado at this price in such a large parcel with these amenitities. 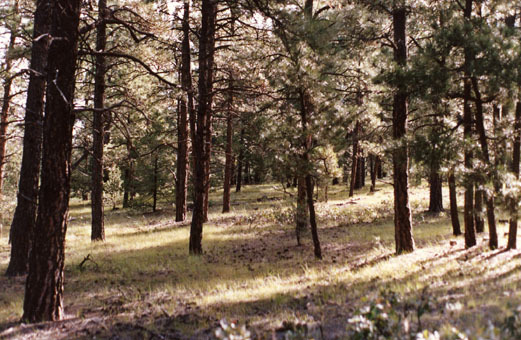 This land is just like that within a national forest, but without having to share it with everyone else. Lush canyon bottom of Castro canyon, below dam/pond. Don't hesitate to ask if you have any question. 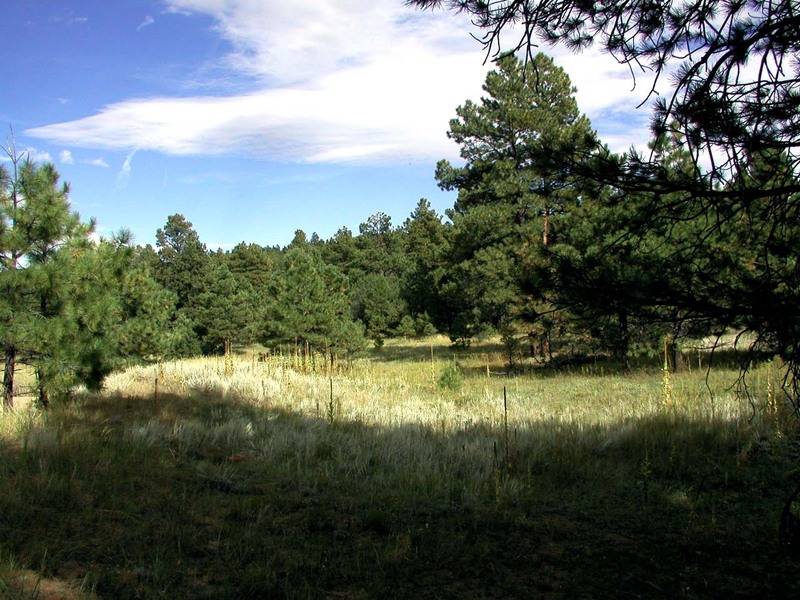 Contact us by email for information about this ranch. Send your phone number. "i n f o" at "c o l o r a d o f o r e s t . c o m". without the underlines or hyphens and the "dot" is of course a period. If we're not in the office, please leave a message and we'll get back with you as soon as possible. Everything seems to taste & smell better in the cool mountain air. This is the view west along the northern boundary from near the northeast corner. Some of those snow covered peaks (Sangre de Cristos, pictured in May) are over 14,000 feet and the pass to them tops 11,000 feet. It's just left of the two close mountains (Spanish Peaks, two extinct volcanoes) on the right side of the picture below. Picture taken from 38ac tract and over the 35ac tract, facing west by southwest. Star is Gulnare, Colorado. Land is just east of there 3+ miles. [ Click here: ] To see the cabin during it's construction process. How would you like to start your day by waking up to one of theses views? Taken from 38ac tract, over the 35ac tract. 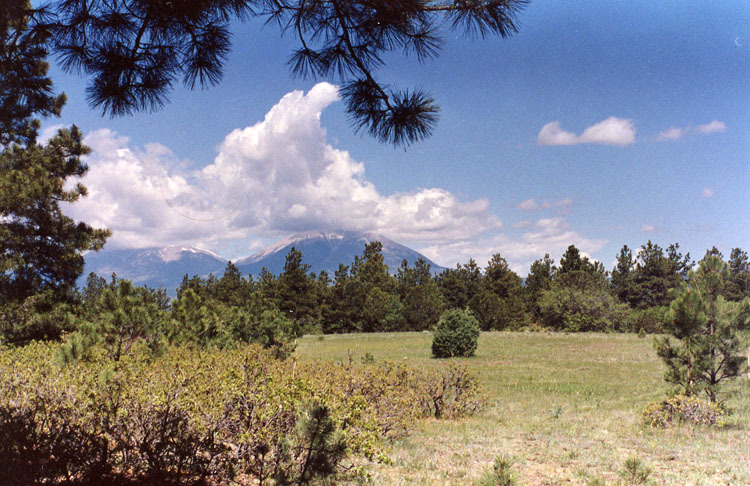 View of Spanish Peaks from a possible building site in the northeast part. Sangre de Cristo's are off to the left and are visible from this location. Picture above was taken from 38ac tract. View of Spanish Peaks from near my favorite building site, at about 7,200' elevation. 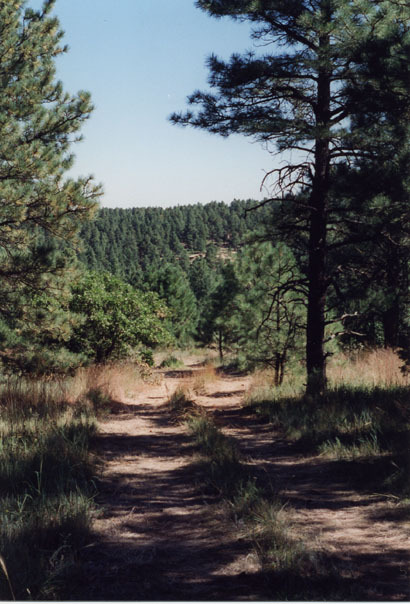 Both "Apishipa Lane" & "Elk Trail" are miss placed onto old jeep trails. 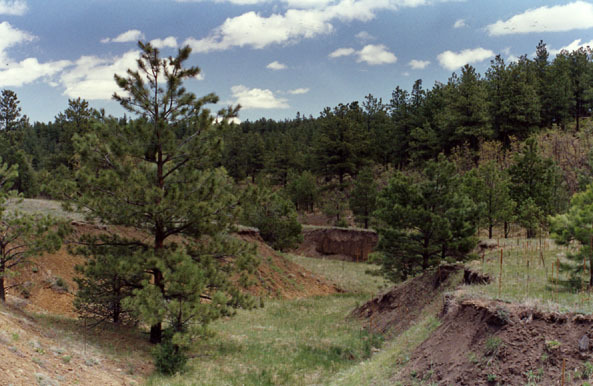 "Bear Claw Pass" that hits this land coming off "Apishapa Lane" on its western boundary. 43.7 goes northeast to Aguilar & 44.0 goes eastwards to Ludlow, both on the Interstate. 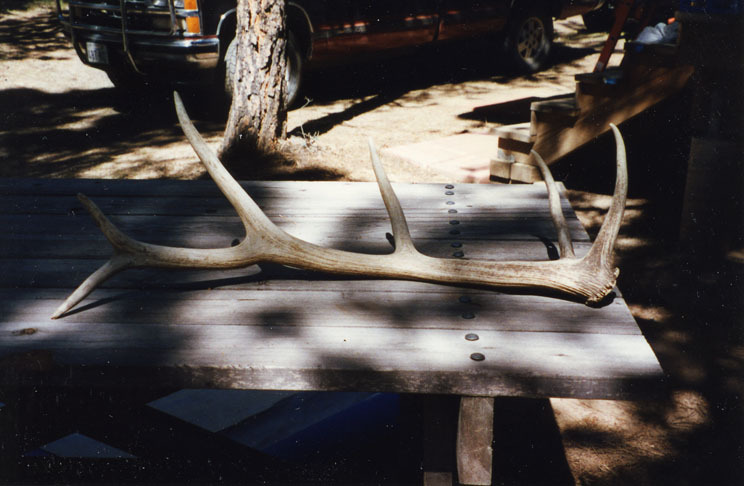 Elk horn found in the high spoon shaped meadow north of the cabin. right above the trees to the left. Facing west by southwest. Road up the eastern side of Castro canyon, electric line alongside. Road heading toward the large meadow south of the pond. have any pictures of them after they were completely rebuilt. Canyon bottom with small stream moving through it. 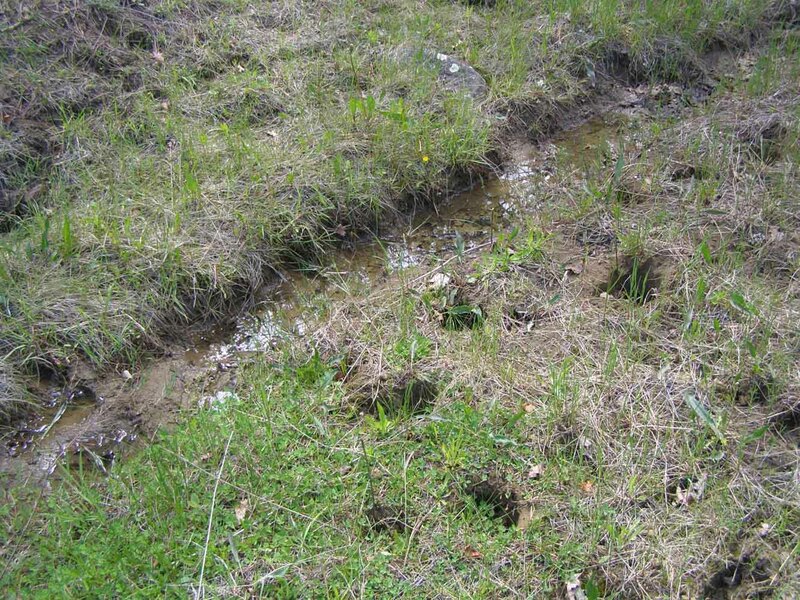 Small pool used by wildlife & some elk tracks (left). Small stream and more elk tracks.